That was the response of George Rogers, who spent 42 months as a prisoner of war (POW) under the confinement of the Japanese military in the Philippines and Japan during World War II. Rogers, for the first time since he was released in 1945, returned to Japan for the Japanese-American POW friendship program from Oct. 10–19 accompanied by his son, Jeffrey Rogers. George Rogers, 96, toured various cities of Japan with his son and eight other ex-POW’s from the WWII era. The program is intended to restore the relationship between the American people and the Japanese. According to George Rogers and his son, the Japanese are teaching the next generation about the horrors they committed against the American people during WWII. George Rogers felt compelled to respond to the letter. After returning to the U.S., he replied with gratitude to the four girls who wrote him that letter. “I was very impressed with your letter and the four girls, because I feel that education and peace is a good direction for the world to go,” George Rogers wrote. Throughout the time in Japan, George Rogers traveled to many places including Tokyo and Kyoto as well as other sites throughout the country. He met with many dignitaries as well as students to help inform them about the relations between Japan and the U.S. 70 years ago. “They’re having a big push in Japan to educate the young about the atrocities that Japan manifested on other people in the world,” Jeffrey Rogers said. George Rogers and the other ex-POW’s visited sites including the Kyoto Museum for World Peace and the Tribute to the Unknown Soldier in Japan as well as meetings with people such as Caroline Kennedy, the only surviving child of President John F. Kennedy, who currently serves as the U.S. Ambassador to Japan. Both of the men wanted to see some of the sites when George Rogers spent time as a POW, but none of the prison camps exist anymore. Jeffery Rogers claimed he learned a great deal from the trip and that it was good father and son bonding time. George Rogers spent 70 years trying to forget all the terrors he experienced in his three and a half years as a POW. In a family journal, his wife, Barbara Rogers, recorded her husband’s experience. According to the journal, on August 20, 1941 George Rogers left his home in St. Louis, Missouri and enlisted at Jefferson Barracks for Island duty in the Philippines. Although George Rogers was supposed to spend six months in St. Louis and six months on the West Coast before he left for service overseas, it was less than six weeks before he was sailing to the Philippines. On April 9, 1942 Bataan fell, and under the authority of General Edward P. King Jr. the Luzon force surrendered to the Japanese. There were 10,000 American troops and 45,000 Filipino troops that surrendered that day on the Bataan peninsula, and with that the infamous Bataan Death March began. The death march took seven days for George Rogers and the men he was grouped into to finish. Afterwards, George Rogers was shipped off to Camp O’Donnell where he would work burial duty for the next four months. One day he would dig the holes 3 feet deep, 6 feet wide and 10 feet long, and the next day he would crawl underneath the “hospital” to pull out the dead bodies and throw them in the hole, 10 bodies per hole. Just recently a lady named Pat Bedford reached out to the Rogers family. Bedford heard of George Rogers story and him pulling out a man from underneath the hospital and saving his life. She informed them that she believes the soldier who George Rogers pulled out that day was her father. Although Bedford is not certain, Leslie Leroy Canfield, her father, told her the exact same story from his point of view before he passed away in 1992. Canfield suffered through the Bataan Death March and served at Camp O’Donnell where he caught Malaria. Canfield told his daughter that if it were not for some unidentified man, he would have lost his life. The trip back to Japan was a success in the eyes of George Rogers. In that letter to the four girls from Toin Gakuen High School, George Rogers left them with his overall thoughts about the trip back to Japan. “Thank you for making my trip to Japan a very special one,” George Rogers wrote. George Rogers holds a special connection to Liberty University as well. After serving as the chief financial officer for more than 25 years, he retired. A statue of George Rogers sits just beyond the gates upon entering into Williams Stadium. In 2010 the George Rogers Champion of Freedom Award was established. The award goes to a person who is connected to Liberty or the Central Virginia area and served in the U.S. military. 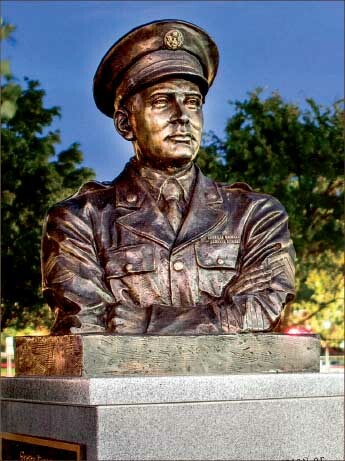 There have been six recipients of the award for their willingness to honor and protect the freedom of the citizens of the U.S. George Rogers was the first recipient on Nov. 6, 2010. Further he received a Purple Heart and the Prisoner of War Medal in June 2012. After Camp O’Donnell George Rogers fought for his life day in and day out at Cabanatuan for 25 months then was moved to Japan for the remainder of his time as a POW. While staying in Cabanatuan, George Rogers came down with Malaria but never received any medicine because there was no hospital there. He was transported to Japan by what prisoners called “Hell Ships,” according to the family journal. After 17 months of work at Yawata Steel Mill the first atomic bomb was dropped on Hiroshima Aug. 6, 1945. “On August 9, the men got up as usual to go to work, but to their surprise the camp commander told them they had the day off,” the family journal said. A few days after that, guards began to disappear and through broken English the Camp Commander made them aware that the war was over. In August of 1945 George Rogers was set free and returned home. When George Rogers left the prison camp, he weighed 85 pounds standing at 6 feet 3 inches. After returning to San Francisco, George Rogers was sent off to a hospital in Clinton, Iowa. There he was served six meals a day and could order steaks and milkshakes whenever he wanted. After six months of hospitalization, he weighed 212 pounds. The doctors told him he would not live past 45. He is 96. They told him he would not be able to have children. He has five, with 14 grandchildren and 18 great-grandchildren. They told him not to bother pursuing any higher education. He graduated from St. Louis University with a 3.2 GPA in three years as the president of his graduating class. He still has his hair and he still has his teeth. The doctors told him that he would probably lose his hair and his teeth. Despite the torture he suffered during the war, George Rogers holds no grudges. PIERCE is a feature reporter.